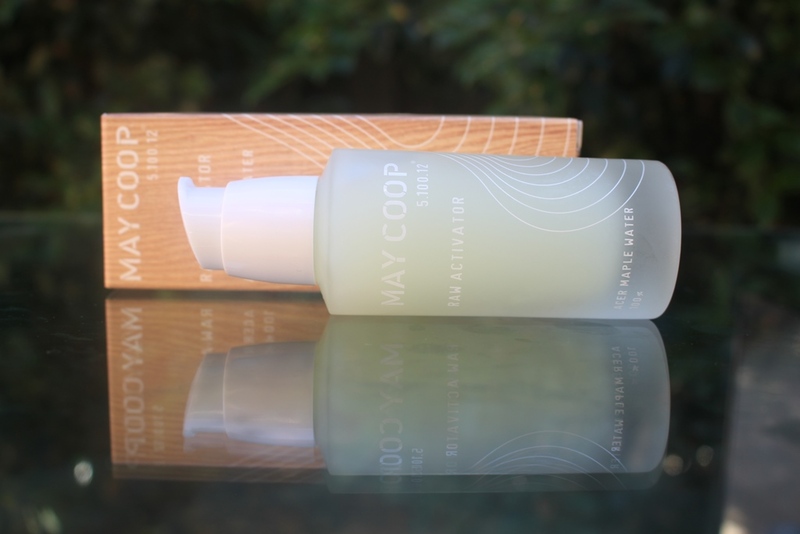 The May Coop Raw Activator is a concentrated serum formulated with 80% maple water, mushrooms, peptides and ceramides to improve elasticity plus firm, smooth and soften skin. The star ingredient in the entire May Coop Raw range is Maple Tree Sap. 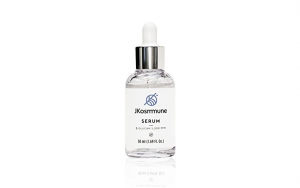 In this serum, it features at a huge concentration of 80% within a waterless formula. The key feature of this inclusion is its ability to absorb easily and hydrate deeply due to its molecular size. Sap molecules are even smaller than those of water. Additionally, it delivers anti-ageing benefits due to amino peptides and antioxidants in its composition which help to rejuvenate the skin. The serum is also packed with hydrating ingredients. The salt form of Hyaluronic Acid is known as Sodium Hyaluronate (HA). It helps to hydrate the skin through an ability to bind to water and fill the spaces between connective skin fibres, achieving a plumping effect. Panthenol (provitamin B5), Trehalose and Allantoin also increase water content of the skin while Glycerin, the most commonly used humectant appears at a concentration second only to the maple tree sap. Shea Butter and Olive Oil add moisturising and nourishing benefits while Ceramide 3 helps to restore hydration by strengthening the moisture seal. There are some very exotic botanical extracts in the formula. Coptis Japonica Root Extract, also known as Goldthread, is an Asian herb cultivated to answer medicinal needs used to treat skin disorders. Goldthread is high in antioxidants and together with its anti-inflammatory properties provides a soothing and hydrating effect to the skin. It has a cooling sensation that helps to decrease skin temperature and in doing so, better balance facial oils, reduce redness and deliver radiance. Goldthread is also said to protect against UV damage and photo-ageing. The extracts of seven varieties of mushroom are also included, namely Maitake, Cordyceps, Hoelen, Agaricus, Meshima, Reishi and Tremella. Topical applications of mushrooms claim skin beautifying qualities due to antioxidant and anti-inflammatory properties. These help treat skin problems caused by inflammation and excessive free radical activity as well as encourage faster skin renewal and increased skin elasticity. Boosting antioxidant activity further are Beta-glucan and Soybean Extracts. Rice Extracts are included to contribute tone enhancement by smoothing and brightening the skin. 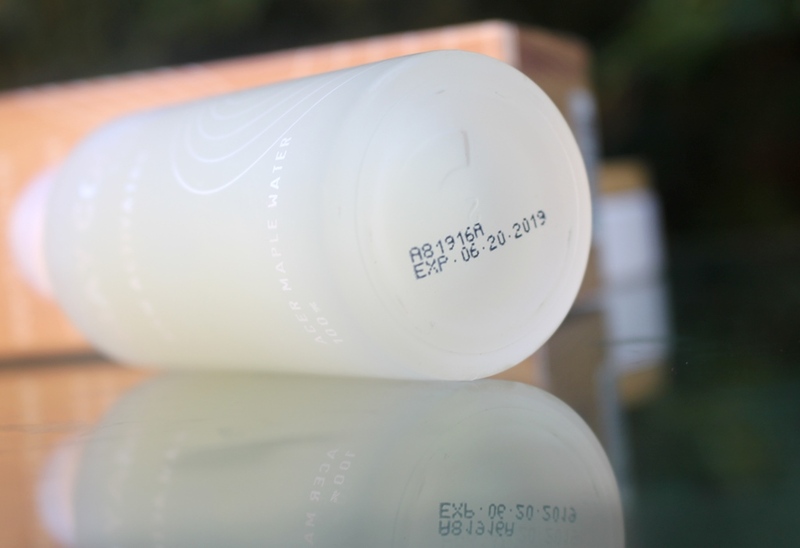 The May Coop Raw Activator is elegantly presented in a frosted glass bottle with hygienic pump dispenser and small protective cap. It is packaged in a cloth drawstring bag and encased in a cardboard box. Fragrance and parabens reduce the safety rating of this product by both the CosDNA and EWG resources, rating the serum a moderate hazard. After using toner, pump an appropriate amount and apply evenly to the face. Tap gently for absorption. 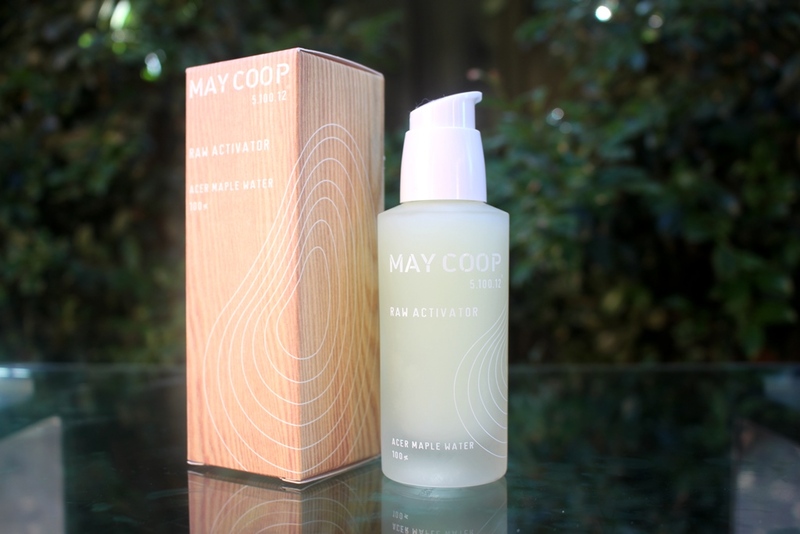 The May Coop Raw Activator has a mild fresh scent. 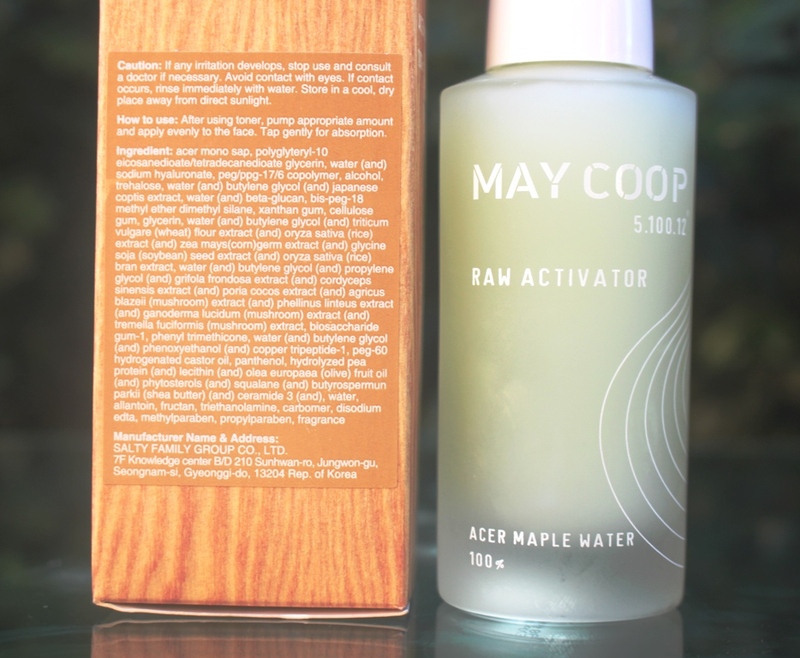 A 60ml bottle of the May Coop Raw Activator costs US$60.00. May Coop products are available at Korean skincare boutiques. The serum must be used within 12 months of opening. I estimate it has a shelf life of 2 years. 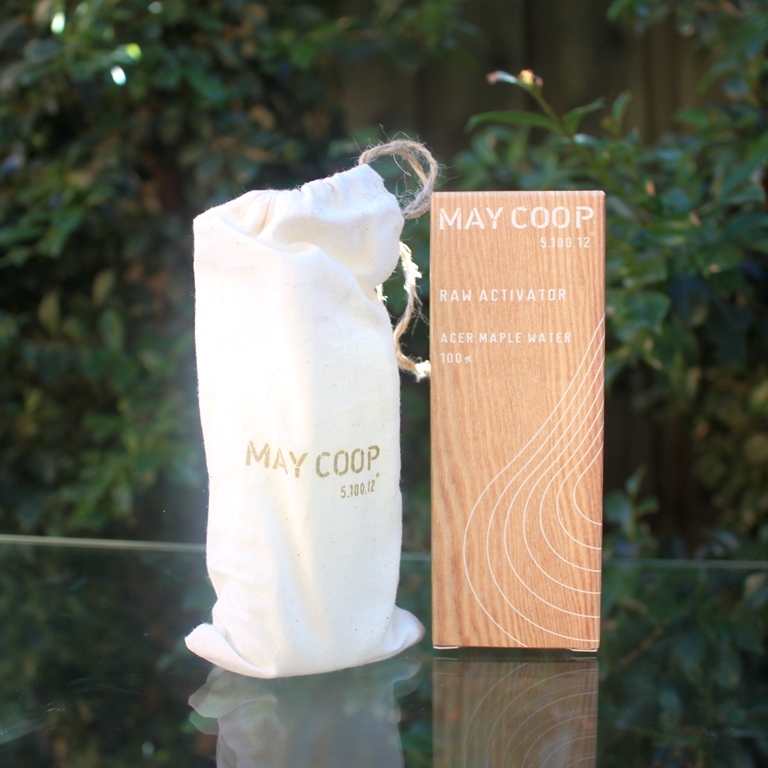 The May Coop Raw Activator is elegantly presented in a heavy glass bottle exposing its pretty soft yellow hue. The pump action release ensures hygienic dispensing. In fact, the lid is secured on and cannot be unscrewed, keeping the contents free of unnecessary oxidation. The serum itself if quite viscous in texture and glossy in appearance. It is quite lightweight and won’t make skin feel congested or heavy. It has a subtle citrus-like scent which is fresh and fairly subtle. It is at least partly contributed artificially by added fragrance so may be sensitizing to those with allergies. Personally, I had no adverse reaction to it. I have used this after toner and before moisturiser in my morning routine for around two months. There is over half a bottle remaining so generous use once daily should see this 60ml bottle last around 5-6 months. This is good as it appears expensive, priced at US$60. However, in comparison to most serums, it’s also twice the size so perhaps not as expensive as initially perceived, although it is quite an investment since there are no guarantees you’ll like it. Two pumps is plenty to cover face and neck. In fact, if you wanted it to last longer, you could definitely get away with a single pump. I can be a little heavy handed and found two to my liking. The application is really satisfying, the serum gliding on effortless and absorbing well. It leaves a slightly tacky surface which lasts only a few minutes, alternatively will be overwhelmed by the moisturising layer to follow. It fit in seamlessly with my existing routine and results were observed quite quickly after commencing use. The first observation I noted was related to skin texture. My skin felt instantly softer, plumper and smoother. Clearly, the Maple Tree Sap is the hero of the formula followed by the mushroom complex. Although they are nourishing, I’m not convinced some of the latter ingredients like Ceramides, Shea Butter and Olive Oil contribute as their concentrations seem very low. I attribute the notable moisturising effects of this product to the 80% maple tree sap. Regarding the product claims, it definitely improves hydration and with that comes better skin texture. With respect to skin firmness, the results I achieved did indicate some improvement on this front, my skin feeling more robust yet soft. I think the improved hydration and firmness are interrelated, the moisture improvement creating a plumping effect that firms the skin and reduces the look of fine lines. I can’t really comment further about perceived antiaging results as nothing topical will deliver permanent results in just two months. Suffice to say that the boost in hydration will certainly prolong ageing compared to drier or dehydrated skin. I have totally enjoyed using this serum and will happily continue to use it until finished. If I wasn’t so interested in skincare, perhaps I would just stick to this one for a few years as the results are great. However, given the huge number of serums I want to try, I realistically won’t be repurchasing unless I find it at an irresistible sale price. However, I would totally recommend it for all skin types although suggest sensitive skin types patch test first. Mature and drier skin types will appreciate the moisture boost while its lightweight texture and application will also suit oilier complexions.